Whether you are vacationing on the coast or simply entertaining in your own back yard, you'll find delightful recipes here for every occasion. This collection is from Martha Justice, Home Economist and long time weekend Galveston Texas Homeowner, who often experiences the challenges of creating easy menus that inspire the relaxed lifestyle of Coastal Entertaining. Order Your Cookbook Today - Shipping Included! 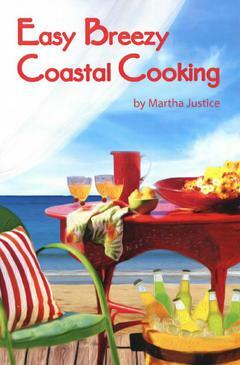 Savor thoughts of warm ocean breezes with this ​​144 page ​cookbook​,filled with more than 130�​delicious ​make-ahead or easy to prepare recipes�​.The book is size 5 1/2 x 8 1/2 and spiral bound in red plasticoil so that pages stay open for easy cooking convenience.�Large type makes every recipe easy to�follow. Colorful and fun�beachy images appear on various pages throughout the book. Beach Bites Appetizers, Simple Salads, Sun Kissed Vegetables, Easy Homemade Breads, Southwestern Soups, Coastal Seafood Favorites, Dockside Dining, Summer Coolers, Getaway Goodies and Breakfast Specialties.